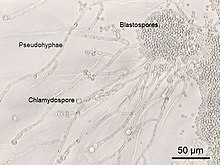 Different morphological forms of Candida albicans: the scale bar is 50 µm. Here is what candida albicans says about it and I give you just the basics, thus if you would like to know there is more about it at Wikipedia and all around the web, but in my opinion this is enough for anyone to get the picture of importance of regular checkup. Please, don’t pay too much attention if your doctor is not giving it so much importance in case tests show your level of candida albicans is higher – do what every there is out there that can reduce it because it can cause many problems in your body. Candida albicans is a type of yeast that is commonly used as a model organism for biology. It is generally referred to as a dimorphic fungus since it grows both as yeast and filamentous cells. However it has several different morphological phenotypes that are discussed more in detail in the chapter on Morphology. It is a common member of human gut flora and does not seem to proliferate outside mammalian hosts. It is detectable in the gastrointestinal tract and mouth in 40-60% of healthy adults. It is usually a commensal organism, but can become pathogenic in immunocompromised individuals under a variety of conditions. It is one of the few species of the Candida genus that cause the infection candidiasis in humans. Overgrowth of the fungus results in candidiasis (candidosis). Candidiasis is for example often observed in HIV-infected patients. 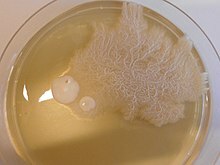 C. albicans is the most common fungal species isolated from biofilms either formed on (permanent) implanted medical devices or on human tissue. C. albicans, together with C. tropicalis, C. parapsilosis and C. glabrata, is responsible for 50–90% of all cases of candidiasis in humans. A mortality rate of 40% has been reported for patients with systemic candidiasis due to C. albicans. Estimates range from 2800 to 11200 deaths caused annually in the USA due to C. albicans causes candidiasis. C. albicans was for a long time considered an obligate diploid organism without a haploid stage. This is however not the case. Next to a haploid stage C. albicans can also exist in a tetraploid stage. The latter is formed when diploid C. albicans cells mate when they are in the opaque form.The diploid genome size is approximately 29Mb and up to 70% of the protein coding genes have not yet been characterized. C. albicans is easily cultured in the lab and can be studied both in vivo as in vitro. Depending on the media different studies can be done as the media influences the morphological state of C. albicans. A special type of medium is CHROMagar™ Candida which can be used to identify different species of candida. Candida albicans can be seen as a tautology. Candida comes from the latin word candidus, meaning white. Albicans itself is the present participle of the latin word albicō, meaning becoming white. This leads to white becoming white, making it a tautology. It is often shortly referred to as thrush, candidiasis or candida. More than hundred synonyms have been used to describe C. albicans. Over 200 species have been described within the candida genus. The oldest reference to thrush, most likely caused by C. albicans, dates back to 400 B.C. in Hippocrates’ work Of the Epidemics describing oral candidiasis. P.S. If you are interested in some cure I tried, before I put on article about it, leave a comment and I’ll answer as soon as I can.